Boil a large pot of salted water. Trim Brussel sprouts, remove any yellow leaves and immerse in boiling water for 4 minutes. Place in cold water to cool then drain. In a sauté pan, heat cubed pancetta until most fat is rendered and the pancetta is crispy approximately 10 minutes. Remove pancetta, reserving a bit of the liquid fat in the pan. Drain pancetta on paper towels. Add the Brussel sprouts and cook over medium heat for 5 minutes. 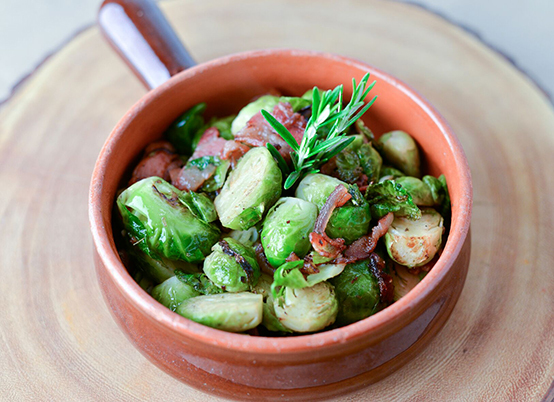 Return pancetta to pan with sprouts and add parsley, thyme, salt and pepper. Serve immediately. Serves 4. This recipe is great for a Thanksgiving side dish.